Streakwave Webinars is pleased to provide the latest product information from WaveRider by Vecima. In diverse environments, especially those where absolute line-of-sight is difficult, you need a solution for your broadband radio applications. WaveRider-by-Vecima gives you solutions and choices that are both affordable and effective. WaveRider has 900MHz NLOS System for WISPs, Telcos and cable operators providing wireless access to broadband services (VoIP, Video, Data). WaveRider has Point-to-Point and Point-to-Multipoint: 5.8GHz, 4.9GHz, 900 MHz for wireless backhaul or enterprise broadband applications. Learn about WaveRider's product applications, benefits, and performance in this free Webinar from Streakwave Webinars. Sign-up and attend today for another informative session. For additional information, please visit Streakwave Wireless at: http://www.streakwave.com or call today and speak with a knowledgeable account manager at: 888-604-5234. Our new Website boasts a new look, easy navigation, increased resources, improved manufacturer landing pages, important links and much more for your broadband wireless equipment needs and planning. Streakwave is working with each manufacturer directly to bring up-to-date information regarding the latest products and provide clear photographs, updated data sheets in downloadable .pdf files and other useful information to help you meet your applications needs. Find resources like custom videos & Webinars, special offers and promotions (example), case-studies, and pricing right at your fingertips. Updated look and feel with easy access to product information and categories. Improved product navigation with wide-spread “breadcrumbs” making searches simple (example). Ordering information appears on the same page as your research so you can easily return to items of interest for further examination. New event Calendar functionality and links to important industry resources including tradeshows and Webinars. Simple product indexing – find what you need fast! Improved online RMA forms and directions. Improved item pages with clearly understandable categories and directions. A simplified log-in that directs you back to the page you were on, so you can continue and not lose where you were before logging in. Updated and easier to use online forms to help with improved online customer service. Updated and improved request for quote and access from just about anywhere on the site. Improved access to manufacturers landing pages with additional resources. Greater integration with social media ( ) so you can get relevant announcements and offers fast. ...And, this is just the beginning. Soon, Streakwave will offer a wide-array of application / solution based navigation and tools. Streakwave is committed to professional and value-added service. This is our specialty. It means we provide much more than just "order taking." It's easy to become a client with Streakwave. With a simple log-in and account features the new Website is focused on making your purchasing decisions easy and fast. Get special level pricing based on your purchasing history. Track your orders and history right from the site. Have a simple question or need a quick answer on availability? 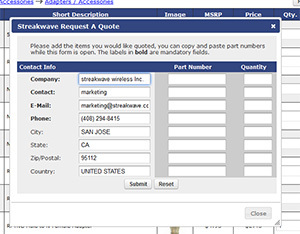 Contacting Streakwave is easy beginning with our simple "Contact Us" form or our anytime "Request for Quote" form. And, keep up with Streakwave news by Twitter and Facebook postings, Streakwave news Blog, and by our newsletter e-Blasts (sign-up on the new site). Our Customer Service Representatives can speak with you directly right now. Need more in-depth information or help planning your project or doing a path calculation? As always, you can contact us by toll free number (US 888-604-5234) and speak directly with Account Managers in the United States for orders for just about anywhere. They have direct knowledge of RF and the wireless broadband industry. These teams work on solutions all day long so you can get the answers you need. 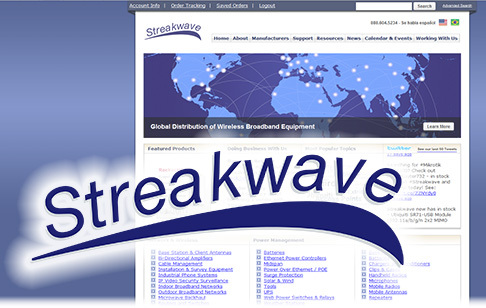 Best of all Streakwave provides global value added distribution and inventory that is stocked at multiple facilities. Still want to use the old Website for a short while? Feel free to click here and the system will bring you back to the prior edition: http://www.streakwave.com/old-site/index.asp This will give you time to explore the updated site for a while but still reference the prior site. Eventually, we will phase out the old site, but this gives you the option to migrate at your pace and explore! We are pleased to present this newly revised site and truly want your feedback, good or otherwise. Please Email: marketing@streakwave.com with your suggestions, comments and opinions. We look forward to your input and making your experience with Streakwave the very best.